Get your tickets for the 10th Annual El Pueblo Canta concert! Home Blog Posts Get your tickets for the 10th Annual El Pueblo Canta concert! 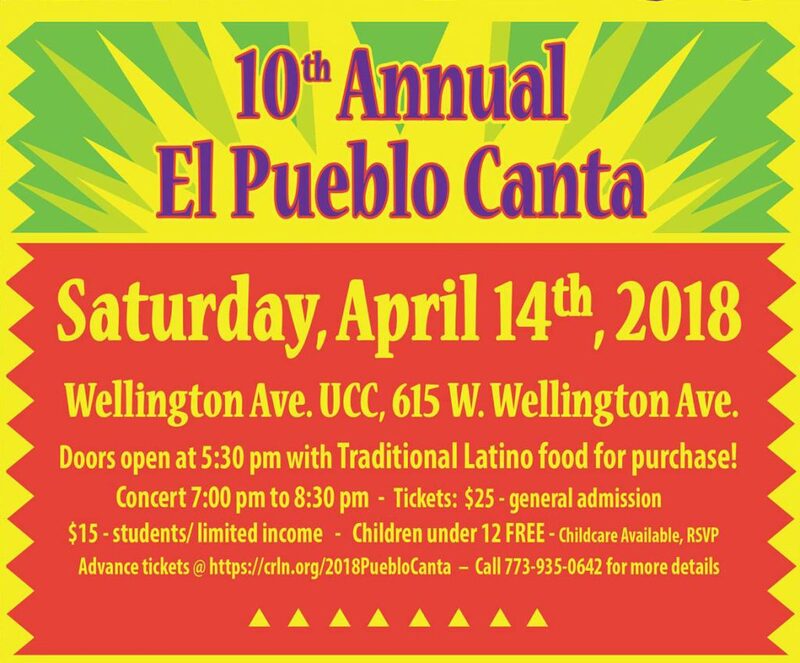 Come celebrate the movement for immigrant justice in Chicago at this 10th Anniversary El Pueblo Canta concert with special guests Jarochicanos, plus Voices, the Wellington Choir, and the “Dare 2 Dream” Centro Romero Youth Choir! Location: Wellington Ave. UCC, 615 W. Wellington Ave.
Time: 5:30 pm — Come eat before the concert! Doors open at 5:30 pm with traditional Latino food for purchase. Parking: Complimentary parking passes are available thanks to Advocate IL Masonic Hospital. If you are a volunteer at the event, contact Kathy at waucc@sbcglobal.net to reserve a pass. If you plan to buy a ticket, the payment form below will also allow you to reserve a pass. Childcare: On-site childcare is available. If you are a volunteer at the event, contact Kathy at waucc@sbcglobal.net with the number of children needing childcare. If you plan to buy a ticket, the payment form below will also allow you to indicate the number of children needing childcare. A #SanctuaryForAll Litany on Epiphany!